At Mary, Mother of God School, the students are encouraged to realize that the school is one part of a broader Christian community and that we must serve God by putting ourselves at the service of others. This broader community is very much a part of the daily life at Mary, Mother of God School. The students take an active part in the parish life of both St Vincent de Paul Church and Holy Family Church, they visit the neighbourhood seniors' residences to sing and recite poetry, and they take part in community initiatives to help those in need, such as by volunteering at St Francis Table, participating in Serving Charity, or collecting food and other items for Canadian Food for Children. Since Lent 2003, the students have faithfully raised and contributed alms during Lent for his Excellency, Bishop Kasanda of Mbuji-Mayi in the Democratic Republic of Congo. As part of its service to the community, the school has sponsored public lectures by major speakers such as those by George Weigel (2003) and Scott Hahn (2001 and 2005). 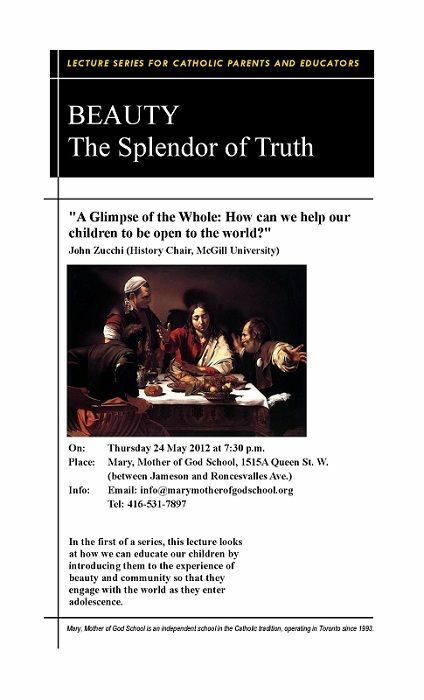 We have also been able to offer lecture series, such as the ongoing Beauty: The Splendor of Truth which featured John Zucchi as its first speaker. Other activities for the extended Christian community include an annual retreat day for women and a men's group, Our Lady's Gentlemen of Good Cheer, which meets throughout the year for prayer, a guest speaker, and fellowship. Plays such as The Diaries of Adam and Eve, concerts of sacred music, occasional conferences for small, independent Canadian Catholic schools, and specialized evening courses in the history of Christian Art have all helped the school continue to edify and educate all interested in the essential link between Christianity and culture.